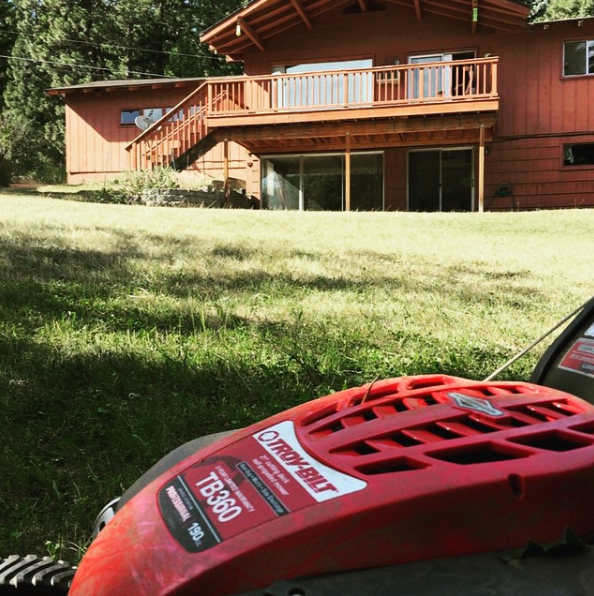 Before I got to work tearing down walls at the new house, I had to mow the lawn. It had been neglected for weeks. Our previous house was built on a .1 acre lot and the backyard was pretty small. 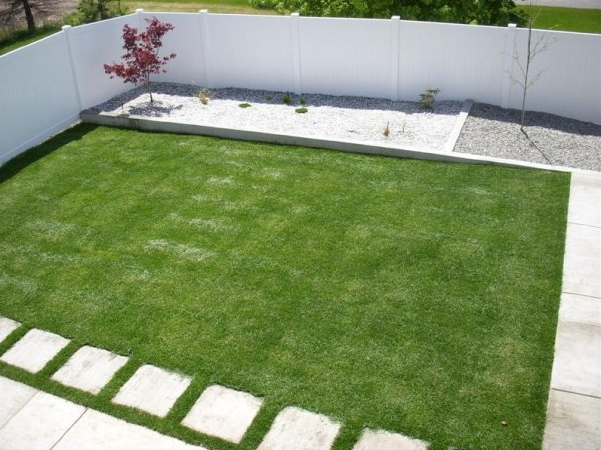 I designed the landscaping to make the lawn even smaller. Because I had such a small yard, I bought a sweet lawnmower by Brill. It was really fun to use, quiet and made quick work of our small yard. Our new yard, however, required a more serious machine. This house sits on a 1/3 of an acre and most of it is in the backyard. Our backyard is on a fairly decent sized hill and there is currently no sprinkler system. All of those things, combined with a grass hungry pig, have made our new backyard something of a wilderness. I'm afraid we probably won't be able to tackle the back landscaping for several years, but it's still a safe, fun place for the girls to explore and play. What you are seeing is a 2800sqft rancher with a daylight basement. It was built in 1965 (50 years old when we bought it). I believe it was originally a single family home, but it was remodeled some time in the Carter administration and turned into an illegal duplex. The upper floor was a 2 bedroom, 1.5 bath unit and the basement was 2 bedroom, 1.5 bath unit. As you can see from the video, the 2 front doors were separated by that ugly partition so that the right door kept you up and the left door sent you down. Both tenants shared the back yard. (Watch me take out that partition below if you'd like) When we bought it, the original owner (who lived in California) had had enough. He had just paid to have the basement disinfected: a tenant put baby wipes down the toilet and flooded the downstairs with sewage. Gross. That was all cleaned up but the drywall was removed from about 3 feet from the floor throughout most of the downstairs and both of the downstairs bathrooms were pretty much unusable in the state they were in. According to my new neighbors, this house was definitely the biggest negative about this neighborhood. It was a revolving door of strange tenants. There were noise violations, drug busts and other unmentionables on this property. Everyone was thrilled to hear that we were going to convert it back into a single family property. I went in to this with the idea that we were going to do a few cosmetic things, change out the ugly carpeting, and possibly remove a couple partition walls. What we've ended up doing is gutting the whole house and replacing everything but the electrical wiring and framing. It's been a huge learning experience for me and I've really enjoyed it. Stay tuned for part 3 of this series where I start demo work on the basement. On June 12th, 2015, we signed the papers on our house. It's been over a year since then, and I have decided that it's time to write about our adventure in remodeling. Things are finally starting to slow down with the remodel...at least for the time being...and it's probably a good idea to record what's happened thus far. I had my doubts when we saw this house for the first time. It was in rough shape. Joanna was excited about remodeling a midcentury home, and this home was definitely built in the middle of the 20th century. At this point I owned a homeowner's starter pack battery powered drill and circular saw that I had received from my father-in-law as an attempt to make me a man and I had practically no construction experience. We also did not have the money to hire all the work out. Fortunately, unfortunately, we quickly found out that an offer had already been made on the house by someone else. About 3 weeks went by as we looked at other properties and didn't really find anything we liked. Then, the offer on this house fell through. Joanna really liked it and I had come around to the idea that I could handle a huge challenge: so we bought it. 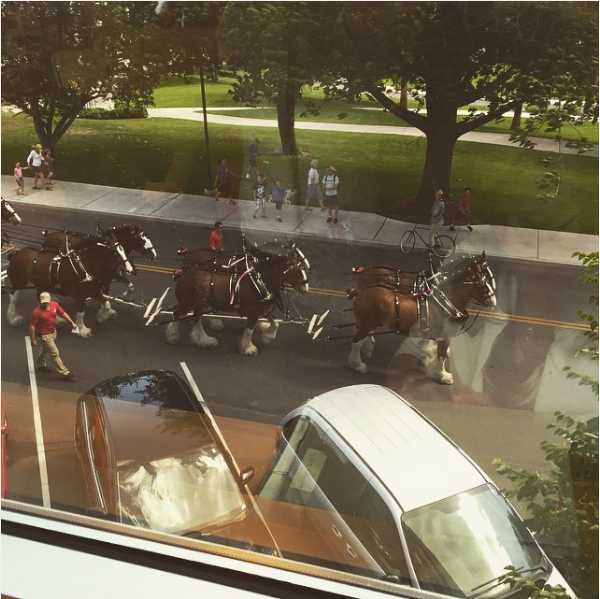 I knew it was a great idea because at our signing they brought out the clydesdales. We didn't move in until the middle of July, but I started work on the house almost immediately. I will write more about that later. Repentance, faith and regeneration. Repentance is a change of mind. We sometimes forget that and make repentance about a change in actions. That comes later. It's really a change of allegiance from one god (usually yourself) to another God (Jesus). Repentance is a one-time action and a continual action throughout our Christian life because we tend to drift from following after Jesus. …faith is a settled confidence that something in the future—something that is not yet seen but has been promised by God—will actually come to pass because God will bring it about. Thus biblical faith is not blind trust in the face of contrary evidence, not an unknowable “leap in the dark”; rather, biblical faith is a confident trust in the eternal God who is all-powerful, infinitely wise, eternally trustworthy—the God who has revealed himself in his word and in the person of Jesus Christ, whose promises have proven true from generation to generation, and who will “never leave nor forsake” his own. Our faith is only as good as the object of our faith. We can have all the faith in the world, but if the thing that we have faith in fails us, we lose. Jesus will never fail us and it is faith in Him that saves. Regeneration is about being made new. Salvation transforms us into "new world" people. We can have confidence in our relationship with Christ. We can know that we are saved. Grace is one of the "big ideas" of the Christian faith. It is so hard for us to grasp the idea that we do not earn, and do not maintain, our salvation through our own effort. We often desperately want to be thought of as useful when it comes to acquiring our faith. It's all Jesus and none of us. We make a decision to follow, but that's it. There aren't any good deeds or right views that can enhance or change that. It's the glorious truth of the Christian faith that is unparalleled throughout other religions. God really loves us. He loves us with an unending, everlasting love that is totally dependent on his character and totally independent of our actions. This was the biggie. I was literally beaming at the prospect of "discussing" this controversial topic with the group. We have about 25 in the class, so we broke up into 5 groups and I laid out a chart comparing Calvinist and Arminian soteriology with verses to back up each of the 5 points of either view. The group wrestled with the text of the scripture for about 30 minutes. It was fun (for me anyway). Everyone came away with their opinions, but I hope we all realized that godly, biblical men and women have taken both sides of the argument for hundreds of years and that we are free to hold to the view that we see as the most biblical as long as it doesn't 1) downplay personal holiness, 2) discourage evangelism, 3) magnify human works, or 4) cast doubt on the omniscience of God. Here's my problem with this classic debate: time. I readily admit that I haven't read all the literature on this subject, but from the books I have read, the Calvinists believe that those who are predestined to salvation are elected in eternity past. He then empowers them by His Spirit to have faith and believe. Arminians believe that God sees into the future, through his foreknowledge, those who will believe on His name and elects them based on their faith. Both of these ideas require God to exist in time. Granted, this concept of God can travel through time, or at least see into the future like a wizard with a crystal ball, but He deals inside a concept of time nonetheless. If God exists outside of time, if time was created with space in Genesis 1:1 (that's an Einsteinian thing) then it is possible that God elected those predestined for salvation in His foreknowledge while simultaneously knowing that the elect are those that respond to Him in faith without any need for a "what happened first" discussion. Doesn't that solve the problem? So, on Monday at Kroc Church Membership Class we talked about the concept of doctrine and looked at Salvation Army doctrines 1-3. We looked at how doctrines have different levels of importance. I shared Mark Driscoll's levels of doctrinal importance that correspond to national and state borders. I also used an example that I stole from Dr. Gerry Breshears. Dr. Breshears says that there are Die For issues, Divide For issues, Debate For issues and Decide for issues. The important thing is that we have the Die For issues (salvation by grace through faith, the trinity, the exclusivity of the gospel, one God) in the right place. There are scads of other things that fall into the other categories. There are some legitimate things that we may need to divide for as Christians that don't reflect upon our salvation. There are also some things that we should believe and commit to living with each other in our differences. We get in trouble when we move the Debate Fors and the Decide Fors into the Die For category or, conversely, when we put the Die Fors into a lower category. We checked out the idea of monotheism, the scriptural evidence for it (Deuteronomy 6:4), and why it is important. That's one thing that I want to keep in the forefront of any discussion on doctrine. If doctrine is a subject that we learn and then set up on a shelf to get dusty, we missed the point. Doctrine is a systematic explanation of the truth we find in scripture. It needs to be the basis for how we live our lives. If these doctrines don't shape our understanding of the world, they are worthless. Monotheism is important because if there is a single being that created the universe, our world, and ultimately each of us, we are accountable to him. In a polytheistic or atheistic universe we are ultimately accountable to no one. It's a big deal. The trinity is probably one of the hardest to understand doctrines on this list. How does it work, and why does it matter are big questions here. Really, no one knows how it works. The word trinity isn't in the Bible. However, it is a word that was coined by a church leader named Tertullian in ~200ad. It is a compound word (tri and unity) that means three in one. The concept of the trinity was not invented, but discovered as God interacted with his people over the centuries. It is all over the Bible (Genesis 1, Deuteronomy 6:4-5, Matthew 3:16-17, Matthew 28:19, and many others). God exists and has existed eternally as three distinct persons. The tricky thing with the trinity is the "who cares" question. There may be a myriad of reasons why understanding the trinity is important. We looked at 2 of them. Love is absolute. - For God to be love, as the Bible tells us (1 John 4:8), love needs to be eternal. If God is a singularity, God is incapable of love prior to creating something to love. Therefore, love is not eternal. However, if God is a trinity, as we see Him in scripture, He has eternally been the giver, receiver, and spirit of love in the relationship of Himself. We need people. - We are made in the image of God (Genesis 1:26). The first thing that God says is not good after He creates the world is that man is alone (Genesis 2:18). Man has God, but that's not enough. In order to image God well, man needs an equal partner to give and receive love and community with. That's the basis of marriage, but I think it's much more than that. I think God's eternal community is the basis of our need for one another. Human beings need each other, and I believe that's because we are created in the image of God, who Himself is in community.